At MPREIS Weer a food market is woven into the surrounding landscape as a way of focussing on the origins and the quality of the produce. The local context and landscape features such as fields, trees and grass are translated into surface and space with the help of both natural and man-made techniques. 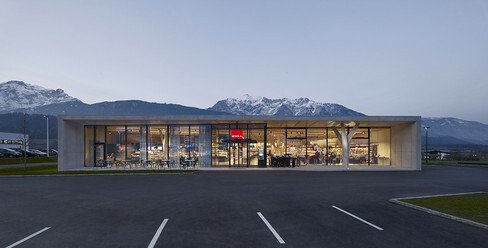 MPREIS is a modern local supplier with a focus on quality that supports the regional economy and attracts attention across Tyrol with its outstanding architecture. The company has now built a new market in Weer that underlines its commitment to sustainability and its awareness of local characteristics. The building is located on the main road on the edge of Weer, very close to the Parish Church. The transparent main façade of the monolithic structure is oriented to the road while the other sides are embedded in the greenery. 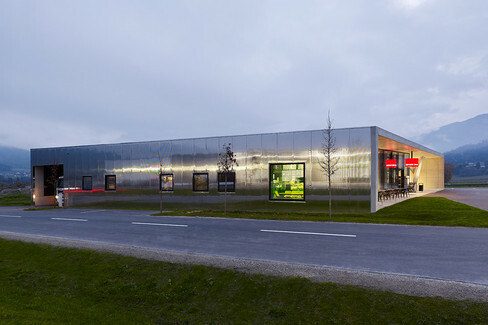 A metal façade of polished stainless steel panels reflects the natural context and – in line with the weather, time of year and daylight conditions – all its changing moods. 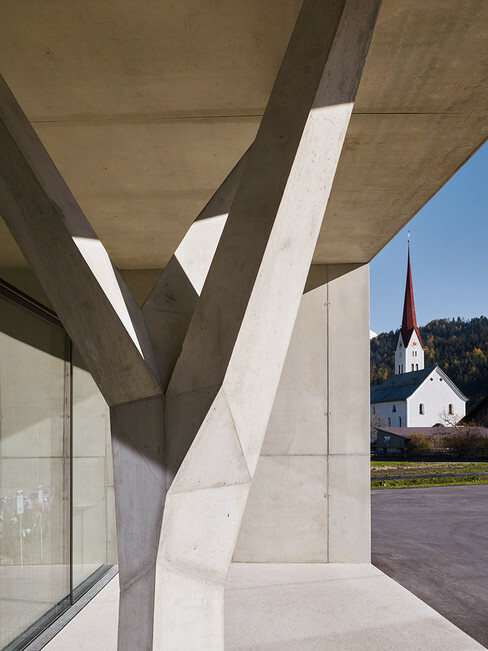 Fair-faced concrete surfaces in the interior emerge on the southern façade where they become visible in the form of a continuous reinforced concrete frame. A glazed internal courtyard with a planted tree draws nature directly into the market, establishing a contrast with the artificial reinforced concrete tree props. 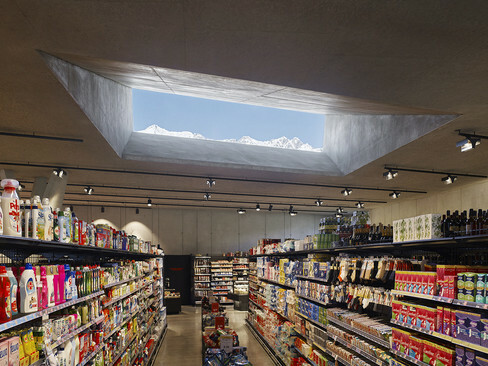 Targeted views of the delicatessen counter and via a shed roof focus on the peaks of the surrounding mountains, creating the perfect frame to the landscape. 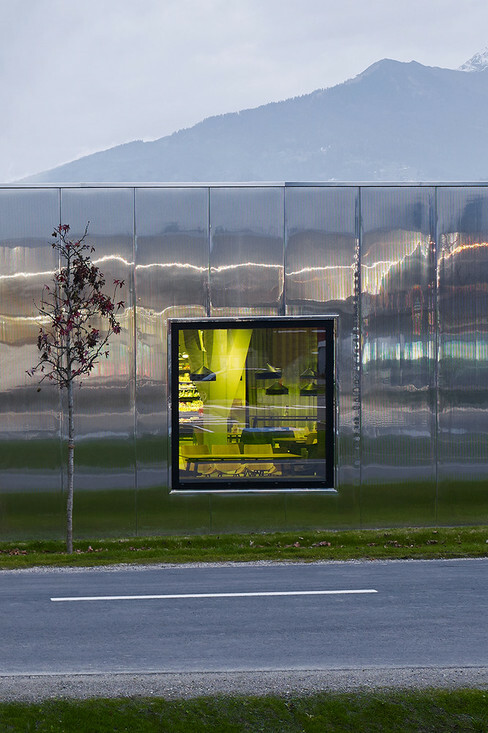 The large glass façade opens the market up to the car park and the village, revealing the goods to passers-by. Materials are reduced to the essential. 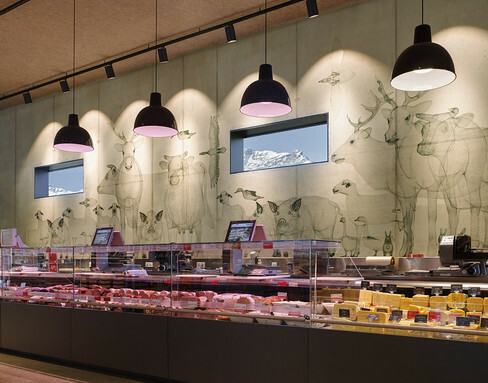 The interior of the market is dominated by fair-faced concrete in warm colours while there is a silky structure to the surface of the concrete ceiling. 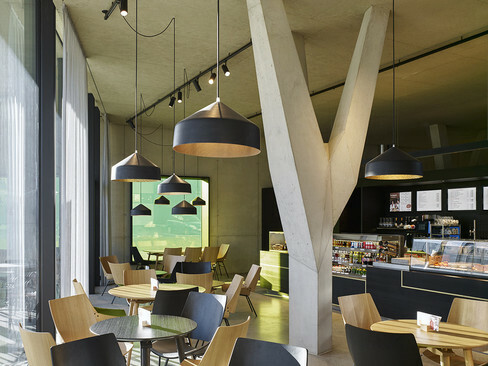 The use of black, brushed timber gives a natural dynamic to the integrated “Baguette” bistro. The specific colour palette enables this to merge homogenously into the overall concept, which is both structured and bound together by brass and green highlights. A range of seating including oak furniture partially upholstered in leather creates a comfortable feel-good interior which extends to the exterior on the south side of the market. The building is executed to passive house standards and exclusively warmed by heat recovered from the extract air. Cooling is provided by natural night-time ventilation. The areas of glazing and the canopy are optimised in terms of the motion of the sun and the roof is fully equipped with photovoltaic panels. Batteries store the solar energy in order to increase yield and improve supply security.